3.7.1 It is important to be able to talk about the everyday things that we do – in past, present, and future tenses. These are actions that happen regularly, so we will often need to talk or write about them. I drive to work at 8am. I usually drive to work at 8am. | I am usually late every Monday! I drive to work at 8am every day. I’m driving to work at the moment. I’m driving to work tomorrow. I drove to work yesterday. I have (just) driven to work. I will drive to work tomorrow. 3.7.5 Here are some of the actions that we do every day. 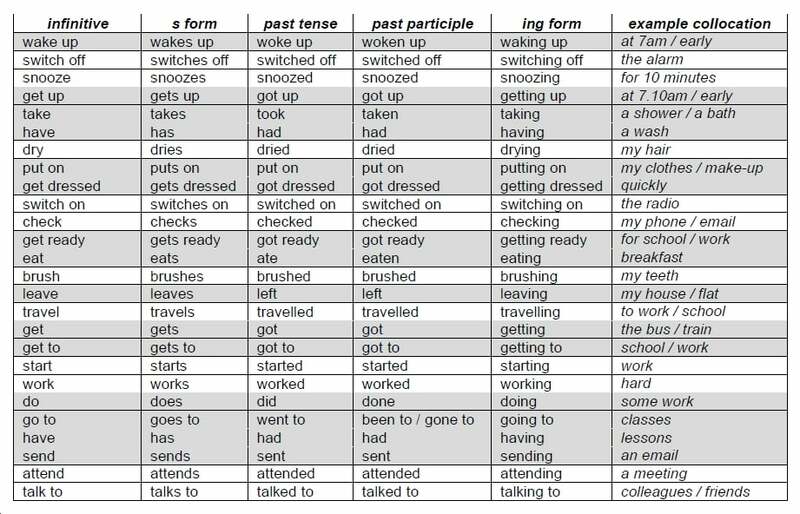 In the table below you will find a list of common verbs in different forms, along with examples of words and phrases that collocate (go well with) those verbs, on the right. Note how many of the verbs that we use to describe regular actions are irregular (in red).These are all phrases that you could use to talk about your daily routine. Of course, we do different things on different days. We may have one routine for weekdays (Mondays to Fridays), another for weekends (Saturdays and Sundays), another for holidays, and yet another for special occasions (e.g. your birthday / graduation, etc.). 3.7.8 When we are on holiday we have a break from our normal routine. We may do a number of different actions, depending on where we go and what kind of holiday we have. Look at the lists of common regular and irregular verbs in Lesson 3.5 for ideas of verbs you can use. Similarly, on special days, such as birthdays, festivals, and milestones (e.g. your graduation), or unusual days when something extraordinary happens, you will need to use a range of different verbs. Write 10 sentences in present simple tense, for example: I usually eat breakfast at 8am every day. Ex. 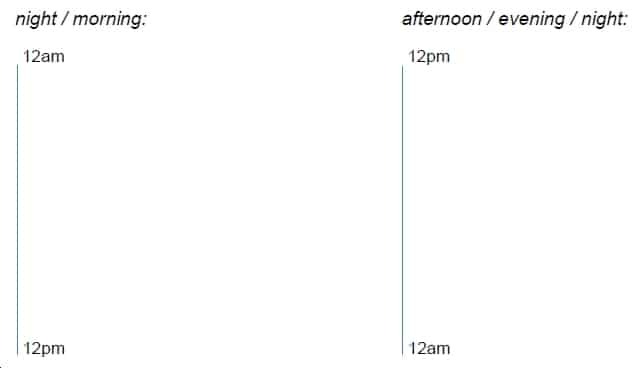 3.7.2 Writing Write 10 sentences in present simple tense to show what you usually do at the weekend. For example: I usually play football at the weekend. Ex. 3.7.3 Speaking & Listening Discuss your activities with your partner. Find out what they usually do during the week and at the weekend. Ask and answer questions in different tenses, e.g. ‘What do you usually do on Sundays?’ / ‘What did you do last Sunday?’ Then tell the whole class about your partner’s activities. Example: I’m eating breakfast at 8am tomorrow morning. Example: I played football in the park yesterday. Example: I have played football in the park today. Example: I will do my homework tomorrow. I ____________________ the newspaper at 8.00am. I ____________________ a coffee break at 10.30am. I ____________________ a shower at 7.30am. I ____________________ a bus to work at 8.30am. I ____________________ up at 7.15am. I ____________________ work at 9.00am. I ____________________ lunch at 1.00pm. I ____________________ to my friend on the phone at 2.30pm. I ____________________ an email at 2.40pm. I ____________________ up at 7.05am. I ____________________ breakfast at 7.45am. I ____________________ home at 5.00pm. I ____________________ my guitar at 9.00pm. I ____________________ dinner at 6.00pm. I ____________________ to bed at 11.10pm. I ____________________ football at 7.00pm. I ____________________ a book at 10.00pm. I ____________________ to the radio at 10.40pm. I ____________________ TV at 8.30pm. I ____________________ the dishes at 6.30pm. I ____________________ to sleep at about 11.20pm. b) Write the sentences in the order that they happen. 1. Billy ______________ a book with his sister on Sunday before tea. 2. Billy ______________ a dictionary in class on Tuesday at about 10am. 3. Billy ______________ an argument with his sister on Sunday after breakfast. 4. Billy ______________ breakfast on Monday at 7.20am. 5. Billy ______________ his friend about his new dog on Friday at lunchtime. 6. Billy ______________ late for school on Tuesday. 7. Billy ______________ a gold bracelet in the park on Wednesday at 4.35pm. 8. Billy ______________ his sister with her homework on Thursday night. 9. Billy ______________ to the cinema on Wednesday evening. 10. Billy ______________ around the park ten times on Saturday morning. 11. Billy ______________ rugby for an hour on Monday after school. 12. Billy ______________ a new bike on Thursday afternoon. 13. Billy ______________ ill on Tuesday before breakfast. 14. Billy ______________ his teacher a gift on Thursday at 8.15am. 15. Billy ______________ a model of the Leaning Tower of Pisa on Friday afternoon. 16. Billy ______________ his friend borrow his pencil on Thursday at 9.45am. 17. Billy ______________ some news about his grandma on Friday at 11.25am. 18. Billy ______________ his younger sister to a concert on Saturday at 3.10pm. 19. Billy ______________ his house early on Wednesday morning. 20. Billy ______________ a few emails on Monday after tea. b) Put the sentences into time order, from Monday morning to Sunday evening. 1. She has ______________ her tablet by dropping it on the ground. 2. She has ______________ hard with her international team. 3. She’s ______________ the hotel manager for more pillows. 4. She’s ______________ forgetting to ask for things in Swedish. 5. She has ______________ to enjoy travelling without her family. 6. She has ______________ sushi for the first time. 7. She has ______________ two important contracts with local builders. 8. She’s ______________ an open air performance of Aida. 9. She has ______________ four seminars for local business leaders. 10. She has ______________ on her hotel balcony and admired the lovely view. 11. She has ______________ the tickets to an exciting event. 12. She has ______________ the president of a local cheese manufacturer. 13. She’s ______________ too many cups of expensive coffee. 14. She’s ______________ for a celebratory meal with all her colleagues. 15. She has ______________ to her husband a few times. 16. She’s ______________ on a terrace beside a beautiful fountain. 17. She has ______________ $100 by coming third in a karaoke competition. 18. She’s ______________ some interesting and useful work. 19. She has ______________ the city’s famous art gallery. 20. She has ______________ a lot to tell her family! Ex. 3.7.11 Speaking & Listening Work with a partner. Using present perfect, tell them five things that you have done this week that are true and five things that are false. Mix up the order and ask them to guess which five things you have really done! Then swap roles. Ex. 3.7.12 Speaking & Listening a) Talk to your partner about how your routine changes when it is not a normal weekday or weekend, but rather a holiday, special day (e.g. a birthday), or an unusual day (e.g. you do something that you don’t normally do). b) Use your imagination and describe the daily routine of a famous person or fictional character. What do they do each day – and when? c) Use would + infinitive to talk about your ideal day – what would you do if you could do anything in the world? For example: I would go shopping in Paris; then I would fly to Barcelona… and so on.